Evanston Rebuilding Warehouse executive director Aina Gutierrez speaks at a city meeting Wednesday. The Economic Development Committee approved the recommendation to supply $15,000 worth of funds to the organization’s job training program. The Economic Development Committee approved Wednesday a recommendation to supply $15,000 worth of funds to Evanston Rebuilding Warehouse, a job training program teaching skills in construction and deconstruction to individuals who have difficulty finding employment. Paul Zalmezak, the city’s economic development manager, said at the Wednesday meeting that Evanston Rebuilding Warehouse’s funding request is one part of a local initiative called the Small Business Workforce Development Program, which was created two years ago. The program aims to allow Evanston’s private sector to design training programs that can help develop the local workforce and also expand businesses struggling to find employees. 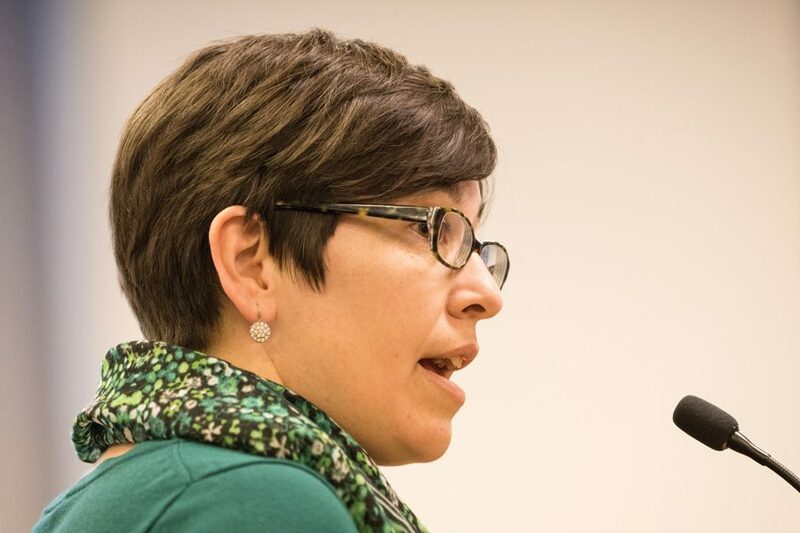 Aina Gutierrez, the new executive director of Evanston Rebuilding Warehouse, said she applied for the workforce development program to help pay the group of five individuals who are currently enrolled in its seven month-long job training program. The trainees, four of whom are longtime Evanston residents, work full time for $10 an hour, spending a majority of their time on-site, she said. They spend about 20 percent of their time in the classroom, where they learn both technical skills and life skills such as financial literacy and wellness, she said. Once the students graduate from the program, Gutierrez said, Evanston Rebuilding Warehouse helps place them into the construction trade through union apprenticeships and deconstruction jobs. The program is growing as the demand for construction, deconstruction and skilled labor increases, she said, and if a trainee were to complete a five-year apprenticeship as a carpenter, he or she could eventually earn over $40 an hour. “We’re not actually just seeking jobs for people, we’re seeking careers,” Gutierrez said. After visiting Evanston Rebuilding Warehouse, Ald. Melissa Wynne (3rd) said she was amazed by the program and the amount of building material its employees are able to save during the deconstruction process. She said she also appreciated their careful attention to safety. Ald. Donald Wilson (4th) said he’s had experience with the organization himself, adding he is grateful for the program’s work in repurposing unneeded building components. Wilson said he considers the organization’s trajectory promising, and believes it will continue to be successful. Other committee members made similar supportive remarks, saying they expect the need for construction and development in Evanston to increase. Committee members also approved four entrepreneurship grants to local businesses and two storefront modernization grants Wednesday.